Andy Peaks has no doubts that AFC Rushden & Diamonds are capable of upsetting Witton Albion in tomorrow (Tuesday) night’s Evo-Stik Northern Premier League Division One South play-off semi-final. Diamonds booked their play-off place with a 5-1 victory over Carlton Town on the final day of the regular season at the weekend. 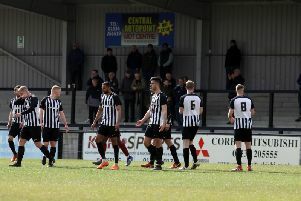 They are now two wins from promotion but they will have to do it the hard way with a tough trip to Cheshire tomorrow evening and, should they be successful, they will also be on the road for the final at Spalding United or Stocksbridge Park Steels on Saturday. The odds would appear to be against Peaks’ men. Runners-up Witton finished 25 points clear of them in the final table, Witton beat them 2-0 twice in the season and the second-placed team have been beaten just once at home so far this campaign. But Peaks isn’t bothered about the statistics as Diamonds gear up for the one-off clash as they bid to move a step closer to promotion. “We are in a situation now where anything else is a bonus but there is nothing to fear for us,” the Diamonds manager said. “They have finished 25 points ahead of us and they have beaten us twice during the season so they will obviously fancy their chances. “But, like I have said numerous times, if we perform to our full capabilities then I think we can give most teams at this level and the one above a good game. “I will always fancy us in a one-off game against anyone and that is what it is tomorrow night.